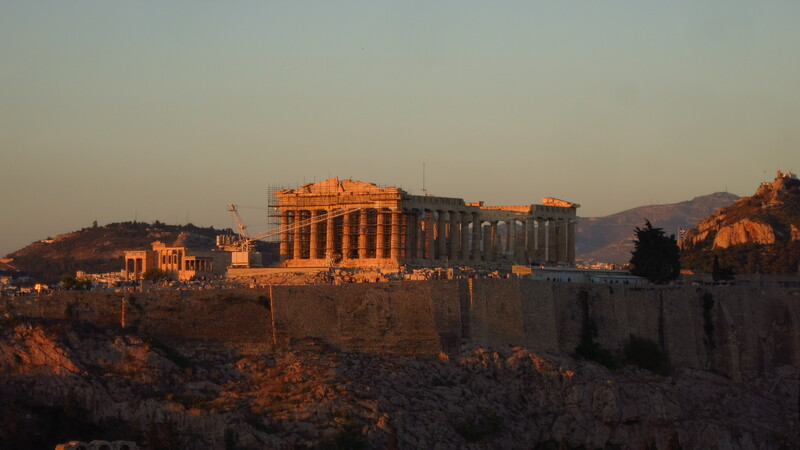 At 7:00 I had already got up, put all my things on the motorbike and ridden the short distance to the B&B where I found my sister and her husband, Alex, who after a sleepless night of travel were all ready and determined to be in the Acropolis by the time the gates opened, ahead of most tourists. 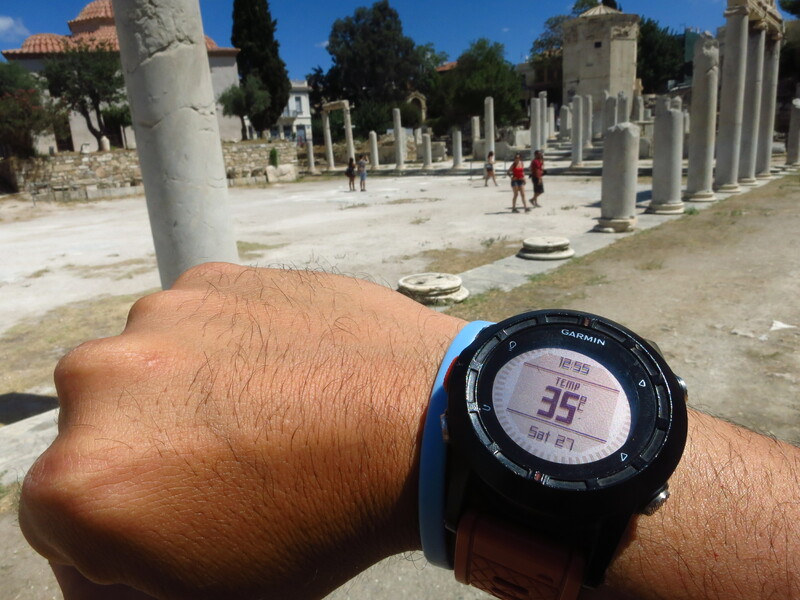 We had some breakfast on the way and little past 8:00 we were at the foot of the hill that contains some of the most famous archaeological remains in the world. There were only a few people queuing ahead of us, and they all looked to be past retirement age, but nevertheless a member of the staff came down the queue asking them whether they were students. They said they weren’t, and so did we when she asked us, but a guy who was behind us, not much younger than ourselves said ‘yes’ and without any further verification, the girl handed him a free ticket. Damn… we could have saved ourselves 30 euros. There were many things to see at the foot of the hill, long before reaching the Acropolis itself, the Odeon of Pericles, the Theatre of Dionysus Eleuthero, the Odeon of Herdes Atticus… But after having spent a while contemplating all these remains, my sister declared that she wanted to see the Acropolis before the bulk of tourists arrived, and that we would have time to see the rest on the way down. Unfortunately, there are some parts in the world where, no matter how fast you run, or how early you get up, you can’t escape a cruise party, and when we reached the main entrance we saw the stairs swarmed with people with little stickers on their polos marking them as belonging to this or that ship, taking pictures and listening to their respective guides, who tried to keep a reasonable distance from each other not to create interferences. The explanations were long enough for us to slip through and walk through the entrance without too much company. 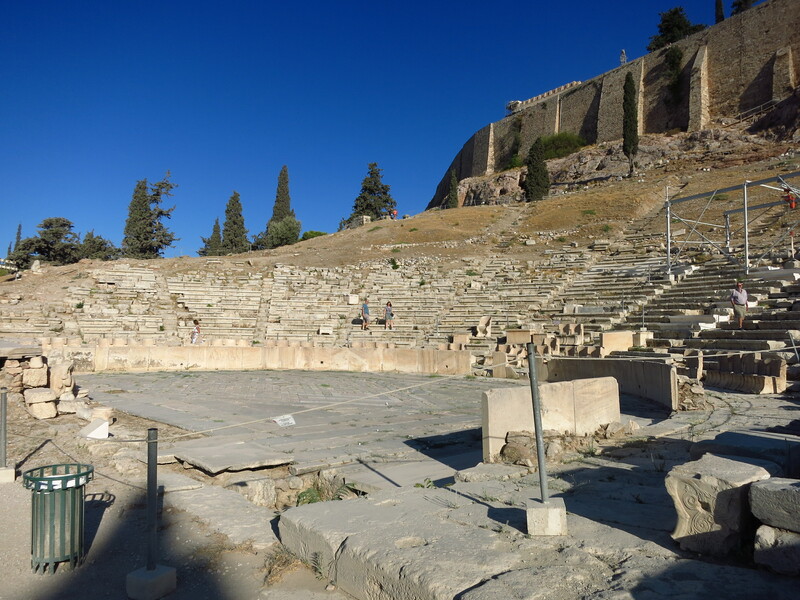 I am not given to getting up early, but this was definitely worth it – walking into a nearly empty Acropolis first thing in the morning, as the sun rises and the morning is still cool, is something that has to be experienced. We have all seen pictures, we have all studied it to a certain extent at school or high school, but actually setting foot on gives a feeling that is difficult to describe. It does not matter how many pictures I might post here or in Facebook, come and feel it yourselves. 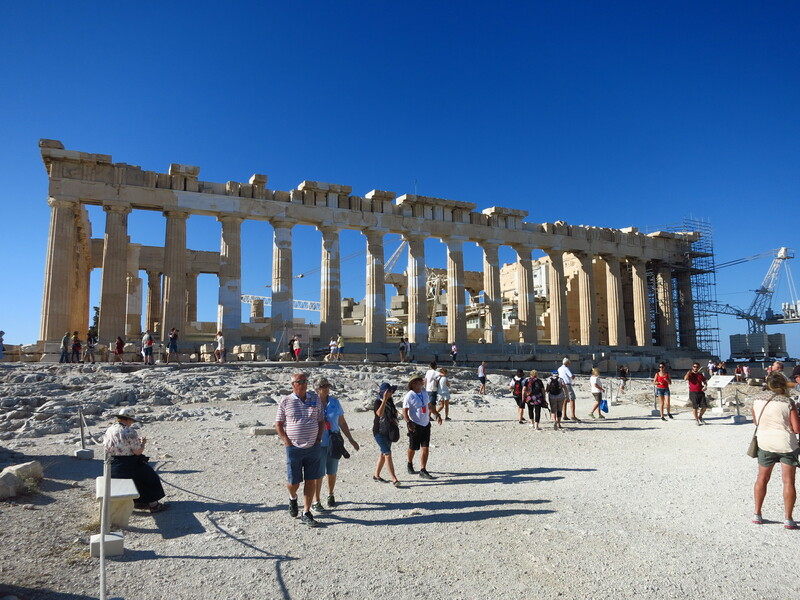 We also visited the flea market on the other side of the Acropolis and wandered for a while around the narrow streets of the Plaka neighbourhood, but decided to save that for the following morning and headed to the Philopappos Hill for the best view of the Acropolis. 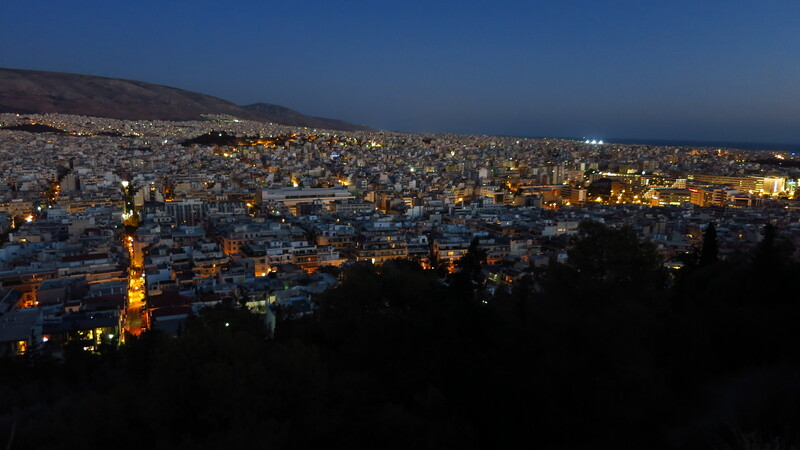 The hill is located to the southwest of the ruins and is the perfect spot to see the sunset with a perfect view of the Acropolis glowing red in the light of the disappearing sun and then contemplate the lights of the whole city turning on little by little, until almost dark, when the Acropolis itself is lit. Amazing. 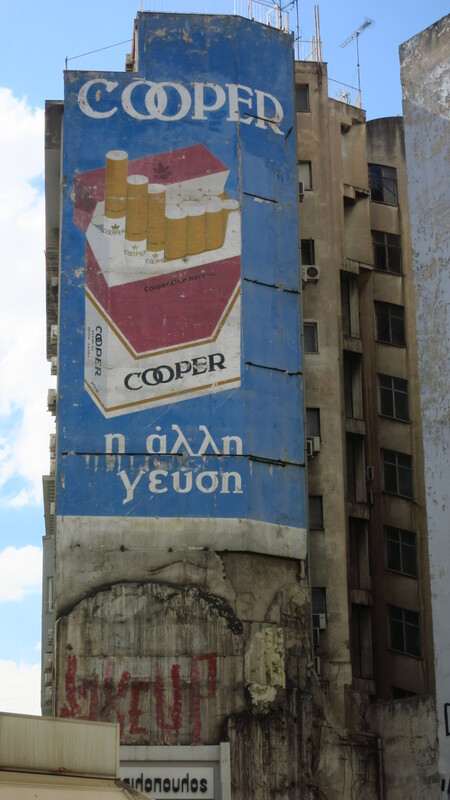 As we walked across the centre, however, my impression of the city the day before was confirmed – away from the Acropolis and the streets that surround it, the city seems to be crumbling to pieces. 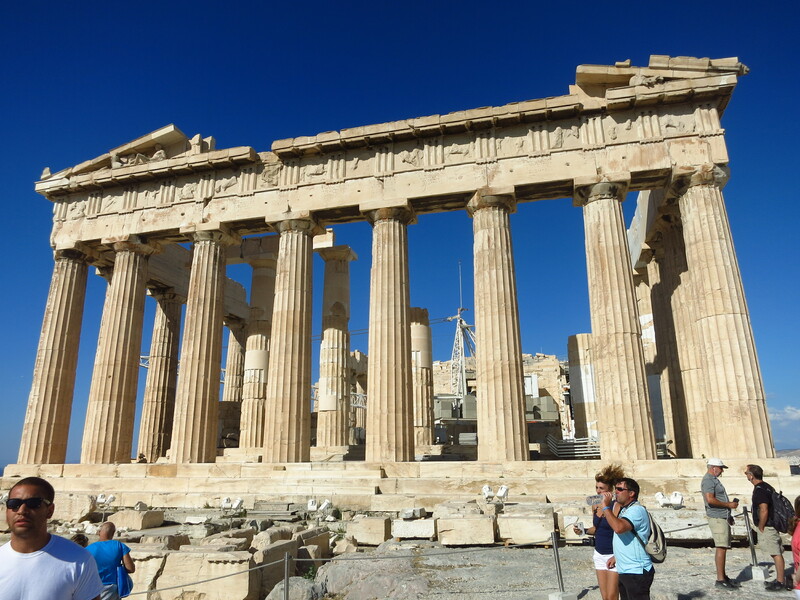 There are a few EU capitals I have not visited yet (Dublin, Bratislava, Luxembourg, Oslo), but I think it is safe to say that Athens was, by a considerable margin, the one in the worst condition. 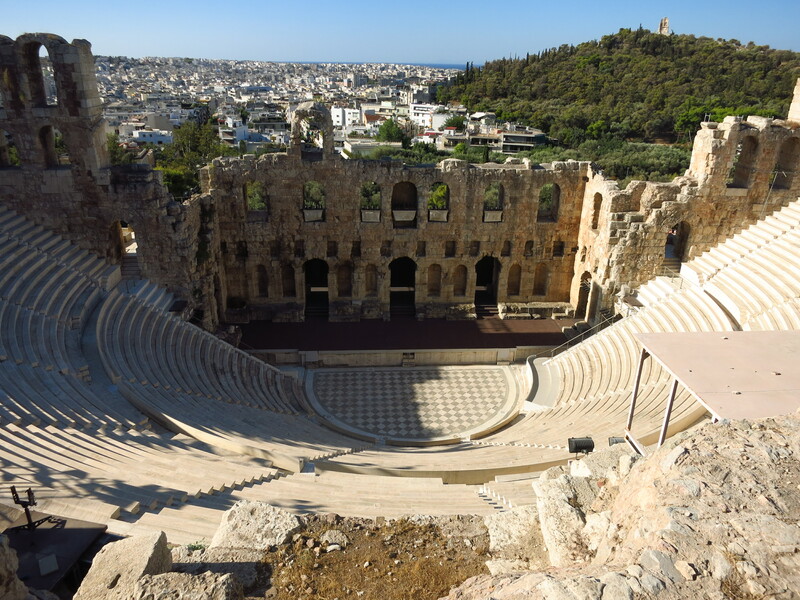 This entry was posted in Balkan Adventure 2016, Travel and tagged Acropolis, Athens, Greece, Honda CRF 1000L, Philopappos Hill by Kilian. Bookmark the permalink.